Currently, the Hario Dripper V60 is one of the most fawned over coffee brewing methods – at least when it comes to pour-over ones. Not only is it quick to use and gets your coffee ready in just a few minutes, but it also looks elegant on every table. Plus, it is also acknowledged as the best way to keep the taste of the coffee. Why Would We Love It? This enchanting coffee dripper has its origins in Japan – the place where all the pouring over mania also started. You can buy it in glass, ceramic or even plastic form (depending on the size of your wallet). 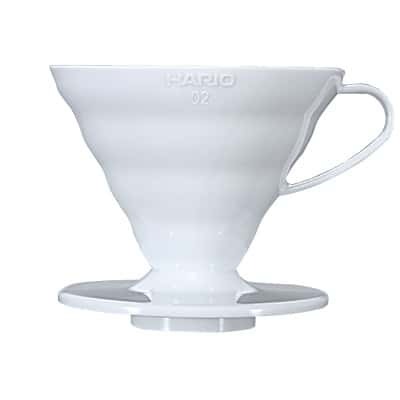 The Hario V60 has a pretty unique design – a cone shaped one – with spirals running through its inner walls. These spiral ridges actually help you keep the paper filter away from the side of the wall. As a result, the extraction of the coffee starts from the bottom and goes all the way to the sides of the filter. The hole you see at the bottom of the brewer is also there for a reason: it allows you to pour the coffee from the brewer and move it into a separate cup once you finished brewing it. Another advantage of this coffee brewer is also the thickness of the filter – or more like, how thin it is. 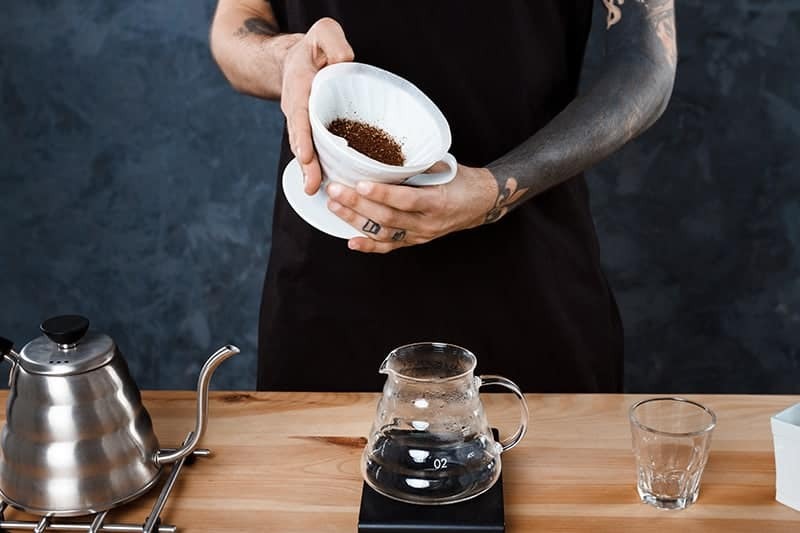 Since its filters are the thinnest on the market, it will allow the flavor of the coffee to flow right through, without leaving any traces of paper taste. Plus, the brewing process is very quick. Once you get the hang of it, the whole process should not take longer than 3 minutes. Therefore, if you are the kind of person who is constantly on the run, you won’t have to wait for ages for your coffee to brew. It’ll be done before you even have time to yawn. As mentioned, brewing with the Hario V60 is pretty simple. It’s even easier than brewing with a French press (maybe that’s why everyone loves it so much). Once you have these added into the mix, you may start brewing it. 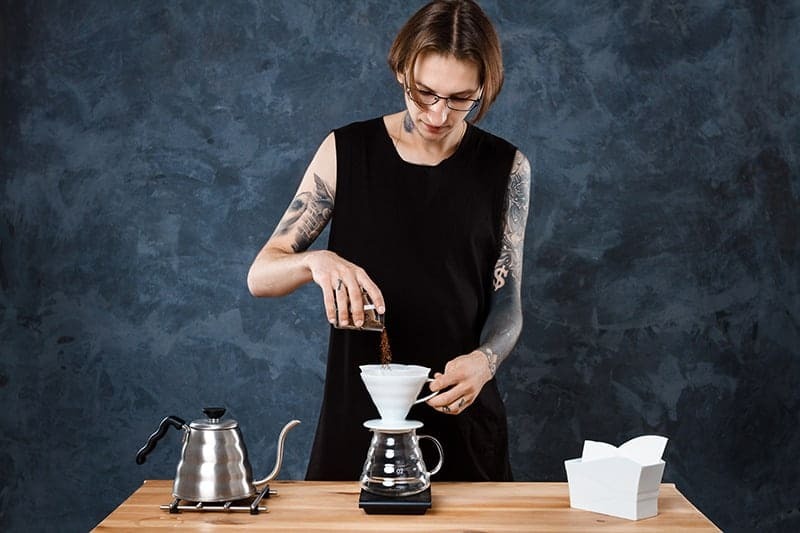 If you're more of a visual person, check out this video on brewing coffee using Hario V60. If your wish is to experience a truly superior coffee flavor, then you may use the following steps as your ultimate guide. We used the other “extras,” to ensure that the coffee you’ll get is nothing less than spectacular. Add some fresh, filtered water into a kettle and place it over a heat source, leaving it there until it comes to a boil. Pro Tip: If you use a gooseneck kettle, keep in mind that not all of them were meant to go on a source of heat. In these circumstances, you may want to boil the water in a regular kettle, and afterward, transfer it into the gooseneck kettle. Take out the gram scale and measure 15 grams of coffee beans for a cup of coffee. Pro Tip: For each cup of coffee, you will need another 15 grams of beans. That means that if you plan to make coffee for two, you’ll need 30 grams. Remember, however, that the V60 can only brew coffee for one (two, at best) at a time. Place the coffee beans into the hopper of the burr grinder, but do not turn it on yet. Pro Tip: You may want to set the grinder to a drip grind/medium-fine setting before you turn on the machine. Add the paper filter to the coffee dripper, and then position it on top of your carafe or coffee cup. Once the water got off the boil, pour it over the filter and make sure that you wet the whole thing. Pro Tip: You may want to invest in a thermometer or temperature kettle for this. The best coffee will need water at around 195-205 degrees Fahrenheit. However, you may still heat it at around 207-208 degrees Fahrenheit, since a lot of the heat will be lost during the brewing process. Throw away the water that you used to wet the filter with and then place the V60 (together with the cup) on the gram scale. At this point, you may grind your coffee grounds and place them into the V60. Shake the dripper for just a bit so that the coffee grounds can distribute evenly throughout the filter. Pour 30 ml of water over the grounds, making sure that you wet all of them. You should use twice the weight of your water when it comes to coffee grounds; therefore, if you use 30 grams of coffee, you need to mix it with 60 ml of water. Pro Tip: When you pour the water over the grounds, start from the middle and spiral towards the edge. Do not pour it over the filter. At this point, the water should only come into contact with the grounds. Allow the coffee to “bloom” from 30 seconds to one minute. Pro Tip: The closer it is to the roast date, the less you’ll have to leave it to bloom. If your coffee is a few weeks past its roast date, then you may want to allow it about a minute. Every 15 seconds add around 30-60 ml of water (again, it depends on how much coffee you used). Do this until your scale tells you that you’ve reached 225 ml. Pro Tip: Every cup of coffee should be on a 15:1 water and coffee ratio, on average. Therefore, your water should be 15 times the weight of your coffee. Take the Hario V60 away from your mug’s top while there is still some water in the filter. Sip and enjoy your coffee! This process may take a few tries until you get it right, but once you get the gist, it shouldn’t take you longer than 3 to 4 minutes to prepare your coffee. Also, make sure that you do not cut the blooming time just to “make the coffee faster. As mentioned, we all have different tastes in coffee – and basically, anything edible. Especially when it comes to the Hario V60, there are a lot of variables to keep in mind. If you feel like the brewing method above isn’t exactly to your taste, here are some hints on how to make it taste even better. Some people don’t like strong coffee. Therefore, if you feel as if your coffee is too bitter or simply too strong, you may increase the water amount or use less coffee as you are brewing the beverage. So, instead of using 15 grams of coffee with 225 ml of water, use 14 grams per 225 ml, or 15 grams per 270 ml. It all depends on your preferences – and the type of coffee that you want to prepare. Fine grinds will make the water pass slower, allowing for extraction. A coarser grind will make the water pass faster, resulting in a weaker coffee. If you feel like you cannot handle fine grinds, adjust the grinder until you get slightly coarser ones. The way we pour the water is also important, so if you feel as if the coffee is not to your taste, pour the same amount of coffee around different time intervals. You can also try pouring more water or do it in various patterns. Just make sure to take notes, so that you remember the method next time you prepare the coffee. Rinse the filter before pouring the ground coffee into the V60, making a small crater in the middle. Pour 35 ml of water and allow it to infuse for 30 seconds. Add another 120 ml of water and let it draw through the coffee. Add the rest until you hit 250 ml and it should be done in less than 3 minutes. With this method, your coffee is going to be smooth and flavorful, with a lot of punch. It will have a heavy body with a sort of rough texture. It’s perfect for those who want to start their day with a kick. Rinse the filter and pour the grounds, adjusting them for an even surface. Pour 30 ml of water and allow the grounds to bloom for 30-50 seconds. After that, aggressively add the rest of the 300 ml of water to break the crust. Don’t forget to add it in a circular motion, keeping the volume of the cone at 50%. It should be done in a little over two minutes. Compared to the other V60 brews, this one is light and a bit crisp. The coffee will come out with little acids and a puckering finish. Rinse the filter and place the Hario V60 on a scale. Add the coffee grounds and make a small indentation. Slowly pour around 50 ml of water in the middle of the indentation and then move your way over the rest of the grounds. Let it bloom for around 30 seconds. Start pouring water again from the center and go around in concentric circles. Make sure that you do not pour on the edges of the filter and that you do not go higher than the grounds. Keep pouring slowly until you finished adding the rest of the water (as in, you reach 390 ml). The whole process should take you around 2 or 3 minutes, after the blooming time. Once the coffee cools a bit, you will be able to feel its inner flavors. There will still be some level of acidity, but it won’t be as prominent as in the previous brews. The key to drinking the best coffee for you is to experiment. At the same time, you should have fun while you are doing it. Take notes on what tastes good and what doesn’t. Drink a cup of delicious coffee. Rinse and then repeat. By doing this every day, you’ll definitely figure out your own “brand” of coffee that no one else has ever tried. 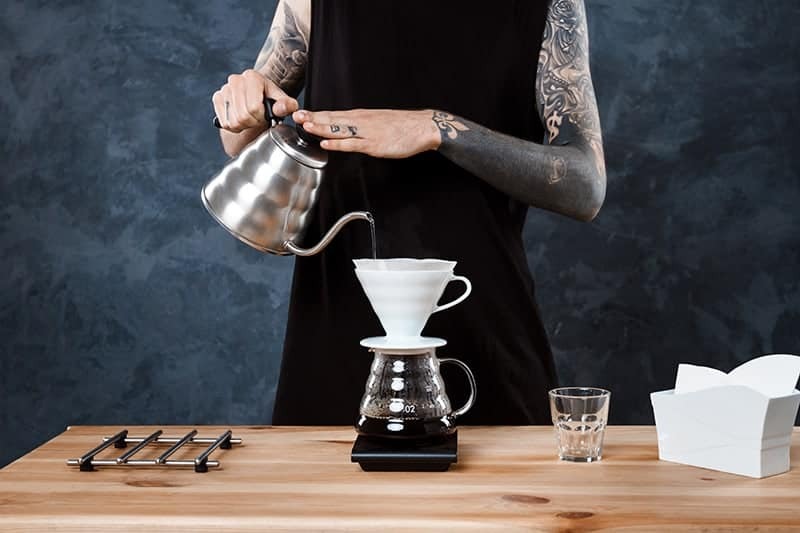 How do you like to prepare your coffee on the Hario V60? 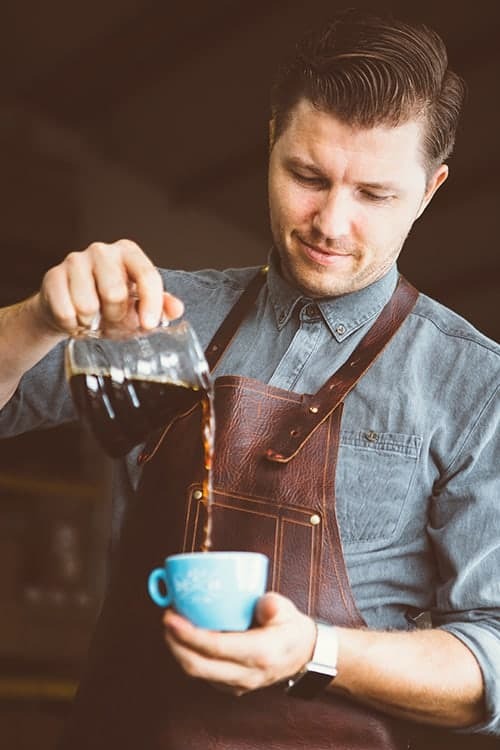 Do you prepare it the way we suggested, or do you have your unique brewing method?